Rizin Fighting Federation 14 will feature Floyd Mayweather vs. Tension Nasukawa in an exhibition boxing match, Kyoji Horiguchi vs. Darrion Caldwell for the bantamweight championship, and many other veterans and rising prospects at the Saitama Super Arena on Dec. 31 in Japan. Yet, no match is as heated as Gabi Garcia vs. Barbara Nepomuceno. Garcia is the most successful competitor in women’s jiu-jitsu history, having collected multiple world titles in grappling, and she holds a 6-0 record since making her transition to mixed martial arts in 2015. Nepomuceno, who had dozens of amateur bouts and a handful of professional bouts in kickboxing, will be making her debut under MMA rules in Japan. The bad blood between the two date back to 2016. After watching Garcia beat Japanese fighters who were close to 50 years of age under the Rizin banner, Nepomuceno issued a challenge to the fellow Brazilian. Garcia wasn’t happy with that, and that feud has only escalated since. Garcia accuses Nepomuceno of being disrespectful towards her and her past opponents in interviews and on social media. Nepomuceno disagrees, saying that her rival has spread lies about her online for months already. They disagree on who did what first, so MMA Fighting decided to give them the opportunity to ask each other anything they wanted ahead of Rizin 14. I see you as the biggest challenge of my career and have been training hard for this fight. How was your preparation? I began competing in MMA as a personal challenge and didn’t have a good camp. When I entered the ring, I didn’t know my opponent was southpaw. I’ve been working harder since with my coaches and my team. When you signed with ROAD FC, I asked for a female tournament because I wanted a chance to fight you because you wanted to fight me and you disrespected me. My coaches have been looking at your fights since May and we’ve been training every single day exclusively for you. I’m more than ready. I used to spar based on instincts before, I didn’t know how to do it, but I’m as relaxed on the feet as I’m on the ground now. I’m more than ready, and I hope you are as well. To have a career in fighting is something amazing, and competing in Japan is a dream come true for those who love martial arts. I’m very excited to be able to experience that with this fight in Rizin. How did you deal with those emotions in front of such a different crowd? 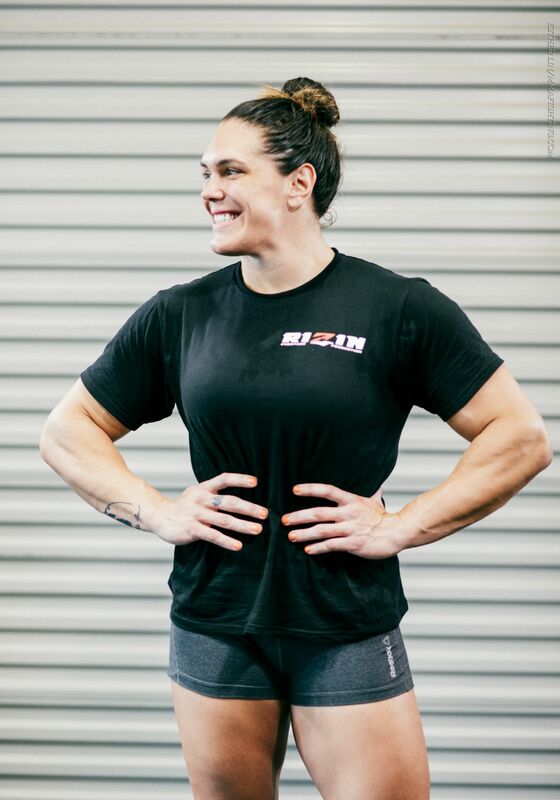 Gabi Garcia is undefeated in MMA. That’s funny. When I watched PRIDE on TV, I never imagined there would be women fighting there, and I was the first to sign with Rizin. When I saw myself at the Saitama Arena, when I heard Lenne (Hardt) screaming my name, it was priceless. You have to be excited for it, it’s a huge show. When I decided to make the transition to MMA, I had many other offers and I asked Fabio Gurgel to put me in a smaller show. He said, ‘Gabi, you fought your entire life in front of many people. A big show or a small show, that’s the same.’ But when the elevator went up and I entered the arena, the crowd swallows you. I was a bit scared. The crowd is different, fans are different. Saitama swallows you. I’m used to that now. I love it. I love the audience, the fans, the media. Walking to that cage is awesome, but some people are not mentally ready for that and get lost. That’s something positive for me and new for you, but you have experience in a ring already. How did your weight cut go? What were the biggest challenges you’ve faced? I’m really strong, kept my diet healthier and doing more cardio now. I haven’t lifted weights in a while, focusing more on speed and boxing. I’m on weight for days now, didn’t want to leave it for the last minute. Losing lean muscle is tougher than losing fat, so I didn’t want to leave for the last days. I had issues cutting weight last year, but I didn’t actually cut weight. I had problems before taking off to Japan and couldn’t cut weight, doctors didn’t allow me to try, so that happened. But I’m ready this time, this is a fight I wanted. You challenged me to fight at any weight and then (Rizin) said you would only fight at this weight, so I said, ‘OK, it could be even lighter.’ I’ve been getting ready for this fight for a long time. What do you expect for the future of heavier women in MMA? What are your thoughts about the creation of more fair weight classes? It was always an issue in jiu-jitsu as well, because of my size, and it’s the same in MMA. Lana Stefanac had six MMA fights at heavyweight, but heavier girls didn’t have a place to compete before. When Rizin started it, ROAD FC and others wanted to create the light heavyweight and heavyweight divisions too, because there are girls to fight. Women who fight at 145 can cut down to 135, but those who weight 165, 175 can’t do that. There should be more weight classes above 145 like there is in men’s MMA. I think it will happen. I was criticised, but this is my job. There’s a big future ahead with two tournaments already set, and I hope I’m still around when they create a light heavyweight and a heavyweight belt. You said in an interview a few years ago that you’d have to fight men in MMA because there were not enough women at your weight. I challenged you in a respectful way, offering to fight you, and since then you’ve attacked me as a person and as an athlete. Why did you feel so offended if MMA is a sport made of challenges? There really weren’t many girls in the beginning. The thing about fighting men, I never said that quote. I was asked if I would fight men one day if I had to, and I said yes. I train with men, but it’s not like I’m going to fight men. I was offered once by ADCC, by Sheik Tahnoon (Bin Zayed Al Nahyan), to enter the men’s absolute division and get paid good money, and I didn’t do it because I know I’m a woman and there’s a big difference between men and women. I want to open doors for women, not to fight men. Japan has this culture of challenges and entertainment, it would even be a possibility for them. If they asked me if I’d fight (a man) for a lot of money — MMA is a challenge for me, I want to challenge myself and make money — well, for good money I’d do it, of course. That was my answer. I didn’t watch that video you did. I saw posts of you making fun of my opponents. It’s OK to challenge someone. I never talked about your technique or professionalism. I heard about you through the media, I didn’t know you. You posted photoshopped pictures of you kicking me in the head and making fun of my opponents. Attack me if you want, but not a pioneer of the sport in Japan. Rizin didn’t see this fight as being interesting for them. I’m under contract and have fought fights I didn’t want before, but I accept the fights. I didn’t take it personal, I didn’t disrespect you. I think you’re a good kickboxer, but you’re not humble. I’m not friends with everyone in jiu-jitsu, but I have good relationship with most of them, but I’ve been getting messages from many kickboxers asking me to represent them because you’re not humble. You can’t cross a line. It’s not personal for me, what I have with you is business, so may the best woman win. We used to text each other and I tried to help you. After a while, the promotion didn’t sign you and you started posting pictures offending me. Why try to get attention that way? We texted each other and had good relationship. However, after I asked you for help to make my MMA debut — in a different weight class — you never responded me again. About those so-called attacks, the first time I talked about you was in that video. People can watch it and see for themselves. After that, you made several comments about me. I never offended you online. I’ve responded you a few times because I was attacked or needed to deny some false information about myself. You said I took it personal after that video and I talked about some injury you had. I never saw that video nor talked about injuries anywhere. Why won’t you try to show your work in an honest way instead of creating lies and using photos of my opponent, one of the pioneers of the sport in Japan? If you wanted to attack someone, why not only me? Yes, you watched that video. And you talked about my injury as well. In fact, you even posted about it on your Instagram recently and on Twitter a few months back that I was using it as an excuse not to fight you. I’m the one who challenged you. Unfortunately, you made fun of one of the the most difficult moments in my career. You can’t cross some lines. Back to your question, many fighters, coaches and international media were shocked that you were going to fight someone 90 pounds lighter, a 52-year-old who was away from the sport for years. I gave my opinion about the fight and don’t remember offending anyone in Japan or even yourself. Criticising is different than offending. I criticised the fact that you accepted the fight. When we’re offered fights, we can accept it or not. If it was me, if forced by the promotion, I would never be able to punch her or even celebrate a win like that. I would try to submit her without strikes because of the reasons I mentioned. I’m under contract and accept whoever they ask. You were not the opponent they wanted me to fight, but I asked Rizin to make it happen. They didn’t want it, I insisted, and that even got me in trouble with some sponsors. When the promotion booked it, instead of focusing on it, you went on to fight at WGP. You say you won, but “decided to save yourself for our fight.” You had four rounds to knock her out, but when you saw you wouldn’t win, you decided to stop the fight. Haven’t you thought about respecting your opponent and WGP? Do you only fight for money and fame? Nepomuceno will make her MMA debut in Japan. Gabi, I don’t believe in any of these things you’re saying about our fight, especially because I have a big company managing my career now and that’s not the story they say. I’m really sorry about the sponsors, but our fight is with such a big promotion and that would hardly push sponsors away. This is weird. About fighting at WGP, I was asked to headline the card before being offered and signing a contract to fight you — I learned about the fight three days before flying to Brasilia to fight. I respect my opponent and the promotion, I would never leave them hanging after giving my word that I would fight. About the result, I never said I won. I said I was winning up until the point I asked [the referee] to stop the fight. The judges’ scorecards showed the same, and that proves the reason I lost was the injury I had during the fight. I’m experienced in kickboxing and I’m used to getting hit, that was not the reason (I stopped), but I don’t care if you believe it or not. If you can’t interpret what I said in the interview, it really gets complicated to understand anything. About fame and money, I come from a humble family — I believe you do, too — and I literally fight for give my family a better life. I have my values, and fame and money would never change that. I don’t respect WGP? Someone who never made weight can’t even ask me that type of question. I had an injury in May and couldn’t jump boxes for three months. You stopped a title fight and was lifting weights a week later. What do you do to make pain go away? Athletes learn to live with pain. That’s high-level, we live on the edge. When I opted to stop my fight, I did that believing something serious had happened to my knee again. That decision was made with my master as well. Lifting weights or any other type of training I do is done with my conditioning coach Felipe Carvalho and my physical therapist Victor Lorentz. They were competent in getting me in a condition to do that in a short time. They are amazing. I have great professionals around me at all times, and that’s why I had those results. In every interview you gave, you said you’d fight me at any weight class, at openweight, but not you say you’re injured, that I’m heavier than you, and that I will have an advantage because of that. Why won’t you just fight instead of coming with excuses about injuries and weight? The fact that you have an advantage is as clear as water. Everyone sees that. I don’t need to give any excuse because I agreed to the weight limit that was offered by the promotion. If you show up at that contracted weight we’ll be there to put on a show for the fans in Japan and the entire world. I never promised a win against you, but I always said I’d be up for the challenge. Once again, thank you Gabi and thank you Rizin for making this dream come true. All interviews were edited for clarity and concision.